Gy14 is an inbred line released by Clemson University at Charleston, South Carolina. 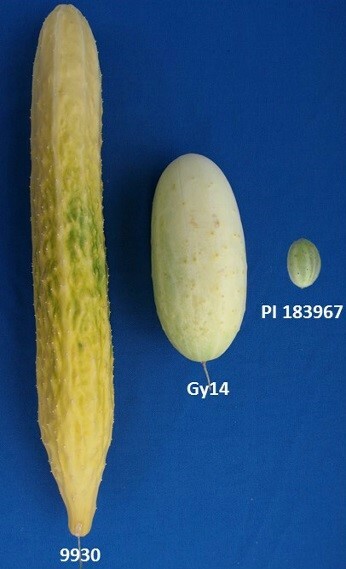 Gy14 possesses excellent horticultural traits typical of North American pickling cucumber. Gy14 is gynoecious and indeterminate growth habit. Immature fruits are light green in color with few large white spines and warts. Mature fruits have creamy white color. The length to diameter ratio at commercial harvest stage is around 3.0. Gy14 possesses resistances to multiple pathogens such as anthracnose, angular leaf spot, scab, powdery mildew (moderate resistance), and downy mildew (pre-2004 strains with dm1 from PI 197087). Gy14 was developed by mating between line Gy3 (released by Clemson University) and Wis. SMR18 (released by University of Wisconsin, Madison, Wis.). In the US, Gy14 has been used extensively in the pedigrees of commercial cultivars.